Posted on January 28, 2019 at 12:52 am. Thinking to go tankless? That is not a problem! 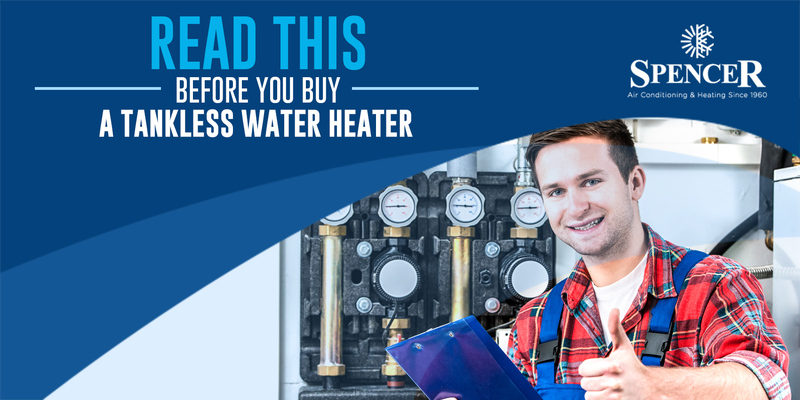 There are several tankless water heaters out there that you can use to warm up your home. But before you shop around for the best unit, read on to know some bits of information and advice from our team at Spencer Air Conditioning and Heating. How Does Tankless Water Heater Work? Your tankless water heater has a flow sensor that detects the water coming into the unit and sends a signal to your control panels to begin a hot water production process. For gas-powered units, the control panels turn on the fan, open the gas valve, and ignite the burner. Its heat exchanger captures the heat from flames and transports it to the liquid that moves through the tube of the exchanger. The mixing valve is the one tempering the boiling water that exits the heat exchanger. Once the temperature sensor detects that the liquid falls short or exceeds of the setting, the panel accordingly adjusts the mixing valve, gas valve, and the flow-regulating valve. The sealed vent on the outside walls or roof carries away the exhaust gas and transfers combustion air toward the burner. How Much The Unit Costs? Small gas-fired heaters may cost nearly $170 while the more expensive, high-output units ideally cost more than $2,000. Tankless electric heaters’ cost, on the other hand, may range from $90 to $900, depending on the size, functionality, and technology. How Long These Units Last? Gas-powered tankless water heaters typically last up to 20 years or more, and they are 2 to 3 times durable compared to tanked heaters. Meanwhile, the electric-powered tankless water heaters have a shorter lifespan that only lasts from 7 to 10 years. The installation of the water heater is definitely a job for a pro and not for someone who knows a little thing about the unit. The work involves making a leak-free vent, water, and gas connection if you are using propane or gas unit, or upgrading the circuit breaker panel and wiring connection for electric units. Is Maintenance for the Unit Required? Besides opting for professional installation, our team also recommends getting an annual water heater maintenance. The maintenance can save you from an untimely breakdown, as your technician cleans, inspects, and adjusts the components of the unit on a regular basis. Not only does maintenance help your water heater run efficiently, but it also helps the unit live longer. Should you need more information about tankless water heaters, or you are looking for professional installation and maintenance, call our experts at Spencer Air Conditioning and Heating.